With ordinary mattresses, they make the bed and you sleep in it. 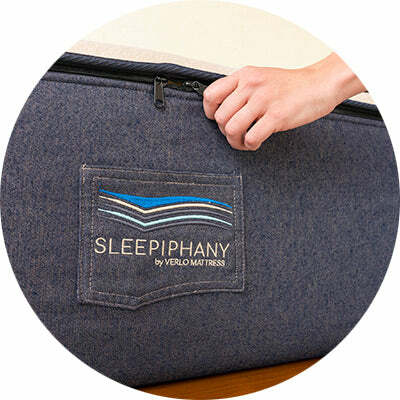 With Sleepiphany, you’re in control. Five comfort layers enable you to co-create your ideal sleep surface. These are the six most popular comfort recipes. You can experiment with hundreds of others. Keeps you cool all night long by regulating body temperature. Provides ultimate bounce and pressure relief. Stack near top. Show your support. Simply move up to reduce bounce. Add firmness with this green dream machine. Keeps you cool all night long by reacting to and regulating body temperature. For smoosh and pressure relief, stack near top. Add firmness with this green dream machine. Stack closer to bottom for a softer feel. These are the 6 most popular comforts. You can experiment with hundreds of other recipes. Not too firm, not too soft.